Rexus, an Imperial warrior, is the personal bodyguard of Amaund Motierre. During The Silence Has Been Broken, he will greet you with,"I have vowed to serve Amaund Motierre until my dying breath. Best remember that." During your meeting with Motierre, he will hand you the amulet and the letter saying, "Here." After Hail Sithis! he will be surprised that you are alive saying, "Well I'll be damned. We heard you were dead. Motierre's in the back room, if you've got business." 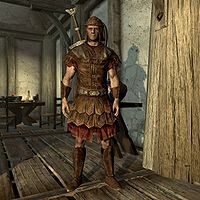 Rexus wears a set of studded Imperial armor, and matching boots and bracers. He wields a steel greatsword in combat. Rexus may become hostile during either of the encounters with him. Yielding will have no effect. This page was last modified on 2 May 2016, at 16:23.